Recently some of the ESB members made a small trek from Young, NSW to Biloela, Qld which is approximately 100k’s west of Rockhampton, Qld. Those trekking included Claude Fuller, Malcolm Yerbury, John Ault, Tony & Maree Barnett and Neville Thompson.. The Callhide Dawson Machinery Preservation Club have an event every year which some of us have attended before known as the Silo Complex. They previously held the National Rally in 2007.and have a great campground and amenities. This year was the biennial Queensland Heritage Rally. Whilst there we met up with old and current members – Don Smith, Joan & Brian Derrick, Les Thompson, Bob & Irene Butler and from the responses to our tractors, hopefully more new members as plenty of membership forms were passed on – hope so. 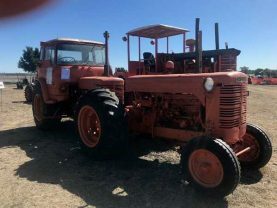 There was a good array of tractors on show, mostly Chamberlains. 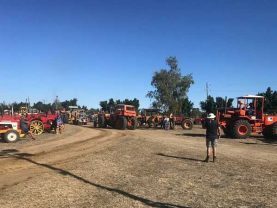 The National Tractor Trek is being held in Young this September and has 160 tractors trekking, and out of those there are 58 Chamberlains, 9G’s making a big contribution. Who would have thought 18 years ago that our trusty 9G’s would become so popular? Anyhow, as usual, it was good catching up with everyone, good weather, good company, great trip so let’s keep on ‘Chamberling Along’. 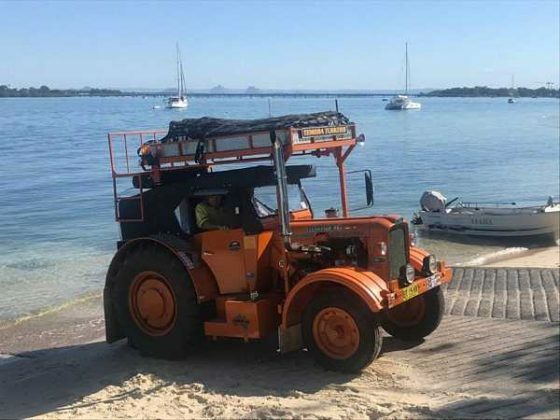 ESB1 Claude Fuller’s tractor with Glasshouse Mountains across the waters.